Debutant director Sunaina Bhatnagar's Dear Maya centres around a forlorn recluse who has probably uttered those lines many times in all the years she has inhabited a derelict mansion in Shimla. Except Bhatnagar doesn't subscribe to such bleak views and dreams up a possibility for miracle around a plot whose optimism is akin to wishful thinking. Such sentimentality is often hard to swallow, but the modesty and good intent of Bhatnagar's ambitions in orchestrating a belated happily-ever-after suffuses Dear Maya with enough warm fuzzies to overlook its faults. When we are first introduced to Maya (Manisha Koirala), she is standing alone in a dark corridor, staring vacantly outside the window in an all-black attire, a dagger hanging by her waist. Her eyes look cold, her face is crumpled, it's as though we are looking at a ghost -- not quite as spooky as the sight of her stack of handmade dolls crafted in a spitting image of her haunting self. Bhatnagar goes for an all-out horror approach to highlight Maya's desolation, but whips a frothy imagery to introduce its other key protagonists -- school-going 16 year olds -- Ana (Madiha Imam) and Ira (Shreya Chaudhary). Tripping on Mills & Boon and Shah Rukh Khan, the two best friends also share a common curiosity for Ana's neighbour, who else but Maya. Despite the preposterous nature of their meddlesome plan and the jarring background score that accompanies it, the letters have the desired result on the object of their fixation. Perhaps Maya welcomes this secret admirer all too readily, but Koirala conveys her hope with an overwhelming sense of appreciation that comes from being deprived and desperate. A good portion of Dear Maya plays out like a thoughtful short story, but its need to be complex forces in conflicts between the two friends. Ana, you see, is a lot more earnest in her commitment to Maya's cause than the frivolous, resentful Ira. What's neat is how authentic they look in the role. Pakistani actress Madiha Imam, evoking a younger Anushka Sharma, is heartfelt and spunky as the high-principled Ana but Shreya's conceit is as half-baked as her apology. As the story -- post-few rude shocks and lingering guilt -- fast forwards to six years later, it compromises on its keen understanding of the adolescent world, the cosy believability of school-time bonhomie and banter to meander through premature ideas of adult life. 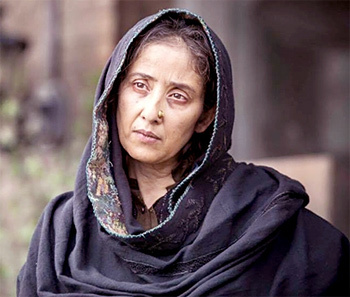 Even when standing on shaky grounds or doling out unintentionally comic cameos (filmmaker Rakesh Omprakash Mehra selling art jewellery), Dear Maya benefits immensely from Manisha Koirala's perceptivity. There are few things as life affirming as the triumph of spirit. As she savours the simple gifts of life in a sequence as sublime as her doe-eyed innocence and benign grace, it's easy to see why the girls couldn't bear to see her so miserable in the first place.